Does Coffee Dilate Blood Vessels? 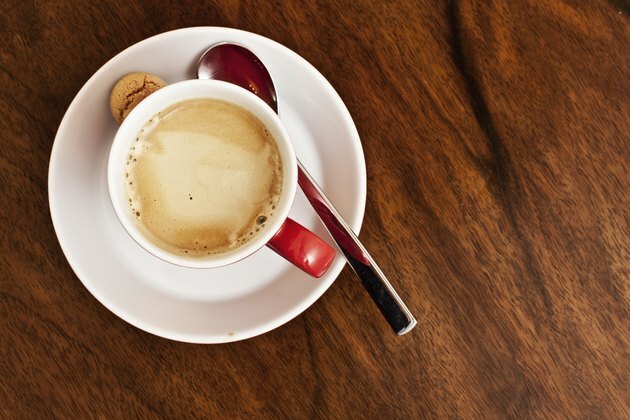 You rely on your morning coffee to help you feel more alert and awake. Caffeine -- the active ingredient in your coffee -- has a number of effects on your body when it first works. The effects may be unpleasant when the caffeine breaks down in your system. One example of how caffeine affects your body is your blood vessels. Understanding the changes in your blood vessels can help determine how much caffeine you can safely consume. Adenosine is a neurotransmitter in your brain that helps to dilate your blood vessels and slow nerve cell activity, which can make you feel sleepier. One of the ways caffeine works is by attaching to the receptors for adenosine in your brain. This means instead of widening your blood vessels as your body normally would, your blood vessels constrict. The presence of caffeine on your adenosine receptors sets off additional chain reactions in your body that can affect your blood vessels. Because adenosine is not present to slow down nerve cell activity, your nerve cells start to move faster. This triggers the release of norepinephrine, one of two hormones responsible for your body's "fight-or-flight" response. The additional hormone, epinephrine, also is activated. The goal of the fight-or-flight response is to reduce blood flow to less necessary organs, including those of your digestive system, and increase blood flow to your brain and heart. This makes you feel more alert and awake. Norepinephrine and epinephrine mean that caffeine can selectively dilate your blood vessels based on what your body would need most in an emergency situation. For this reason, caffeine is generally considered to be a blood vessel dilator. Caffeine in coffee widens blood vessels in the lungs and brain, which can help you breathe more easily and reduce headache pain, respectively. This extra increase in stress hormones, including adrenaline, can also temporarily increase your blood pressure due to the changes in your blood vessels. One of the problems with consuming caffeine in coffee is the sensation of withdrawal. When your body fully uses caffeine, the effects caffeine had will reverse. For example, the blood vessels to your brain and lungs will constrict back to their normal size and those to your stomach will dilate. This can cause you to feel fatigued, have a headache or experience stomach upset. Caffeine affects people differently. Some people can consume a moderate amount -- about two 12-ounce cups of coffee -- without experiencing adverse side effects, according to MedlinePlus. However, you may be especially susceptible to caffeine's effects and experience strong effects when consuming less caffeine than a moderate amount. How Long Does it Take for Caffeine Withdrawal?